Let me start by saying I’m a mess. It’s not uncommon for me to have food on my face. Growing up the running joke was me having spaghetti sauce on my forehead (it happened on several occasions). But I’m also just a general mess. I bumble around and hope I don’t do anything too stupid or too dangerous. This hasn’t changed by me being on the AT. For instance today I dried my pants with fish oil vitamins in the pockets today. Guess who smells a little fishy?? I’ll admit initially I had a little bit of a rough go, not that any of this has been easy. Saturday I left the warm embraces of my mother and the comforts of society to begin my journey north. 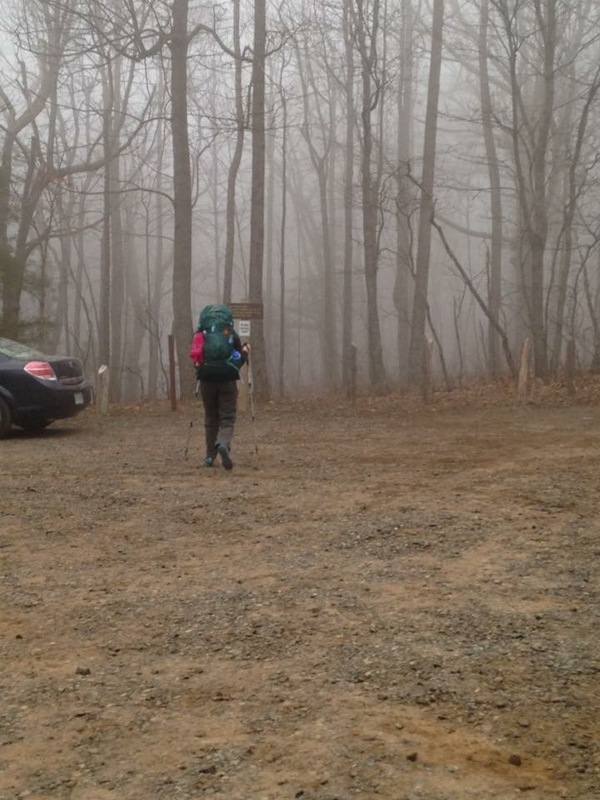 A bit teary and a whole lot unsure I hiked off into the fog. Day 1 saw me at Hawk Mtn Campsite sitting in my tent upset that no one wanted to talk with me. Keep in mind I was sitting in my tent alone, upset that no one was talking to me… Like someone was going to knock on my shelter and go out of their way to talk to me. Trust me I understand the irony. Either way I cried myself to sleep (or at least shed some tears). Day 2 was when the adventure began. About a mile and a half into my hike I was walking along and BAM! roll one ankle on one of the two rocks and my knee to the other. To make a long story short, no I didn’t rip my pants but yes I gashed my knee. Unsure what to do, I hobbled to a log and sat. Bad things happen to other people, and of course I didn’t pack enough supplies. And here I sat with a knee that probably needed stitches miles from the next road. Luckily a trio of hikers came across me in my predicament. I took some of my baby wipes, folded them, and held them on with a bandana (not my pee rag!). Later one the hikers, an older man who seemed knowledgeable told me to super glue it. 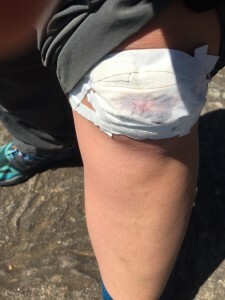 It stopped bleeding and on I hiked. 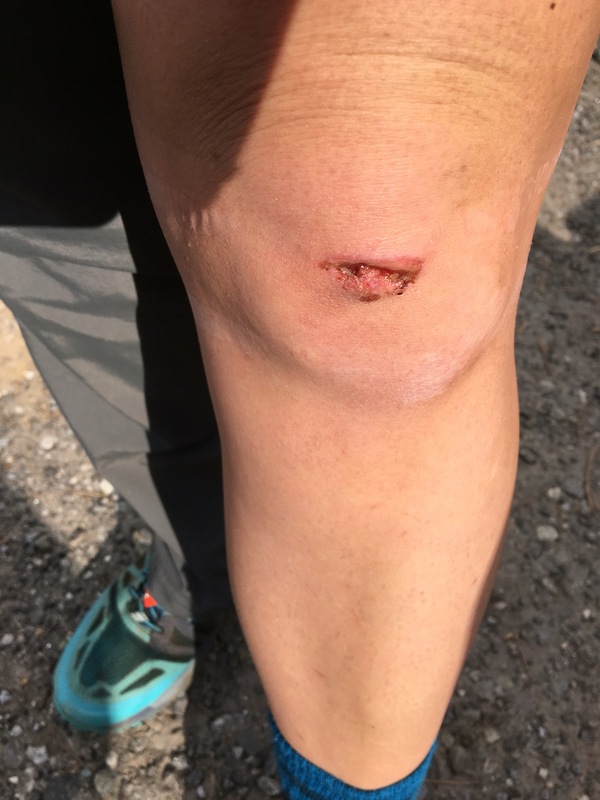 Upon reaching Gooch Mtn Shelter, (I’m only hiking with one pant leg zipped off), the ridge runner (who I referred to as Doc) asked me, “What happened to you?” My response? “I fell.” (Real original I know). Well burly man Doc fixed me up, scolded me for using glue but said I probably wasn’t going to need an amputation. After thanking him, I promptly walked off and stumbled (not falling this time) and made a terrible dinner. Literally the worst dinner. After a terrible dining experience I fell again ripping the bandage. Doc one again fixed me up earning me the trail name of “Training Wheels.” And then it snowed. Dearest burly man ridge runner Doc, you are my hero. You can bandage me up any day. 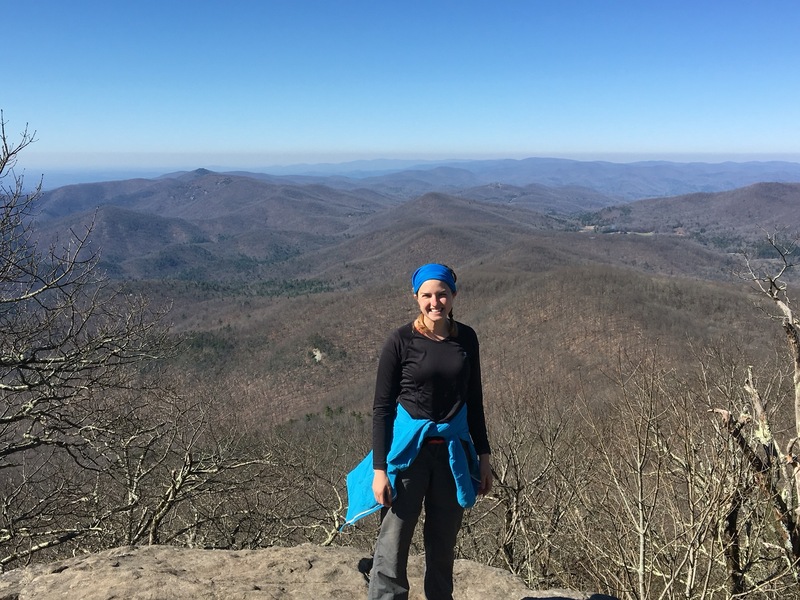 I have been fortunate in that the hiking community is so supportive and welcoming. And I’ve met some great people and learned a lot (like you probably shouldn’t put superglue in a giant gash and that I shouldn’t consider bear bagging as a profession). Today found me at Unicoi Gap and a Nero at Top of Georgia Hostel. Initially I was planning for this to be tomorrow. However they’re calling for severe thunderstorms and I though “ah, rather not.” I’m clean-ish, warm-ish, and not hungry so life is good. (Also 6 days without a shower has been the longest I’ve ever gone. Being clean-ish feels dayum good). Molly, I am super proud of you! You are such an inspiration and a wonderful role model to young adults every where! I will continue to pray for you and of course your momma! Stay positive, not many ppl you’re age would even think of doing this. Just look at you, not only are you doing this, you’re doing it alone and EXCELLING!!!! Way to go Molly!!! Hey Molly! Or, should I say Training Wheels? 🙂 Just wanted to leave a few words of encouragement…. you’re doing great! The beginning is tough, adjusting to an entirely new lifestyle is never easy. But you’re out there and that’s amazing! You’re making a dream a reality, which is the ultimate. Enjoy ToG and your upcoming first New State Day! Way to go! What fabulous memories you are making.Stay tough and carry on! You rock! You’re doing great! I’m sure it will get easier as time goes on. Live reading your posts. Hugs TW! Hey there, I enjoyed you post. Keep it up. I have a friend that did the trail after college and they made amazing memories.Enjoy!! Molly, you truely are amazing and I agree with Mom, Funny. A great smile and determination. Take comfort in each day on the trail as wonderful memories fill your heart. Hey, that was a real gash! But … you forged on. Way to go. 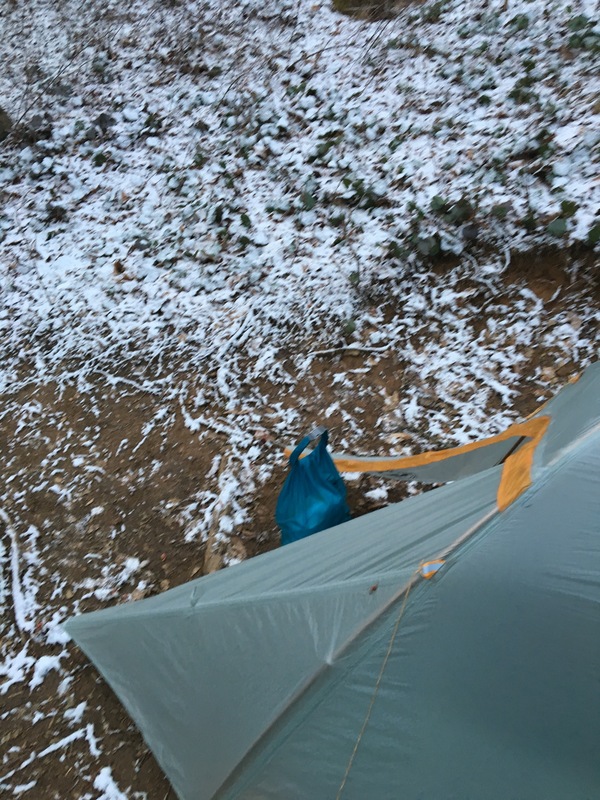 Snow on the AT … that’s a cool thing. I’d like to have seen that. And tell your mom … cool glasses! thanks for sharing your adventure with the world! My son and I are off on our thru-hike next March and I am loving reading everyone’s posts – YOU CAN DO IT….keep on trucking! Ps I’m sure da bruddah is proud too, but we don’t hear from him often. Lol. I’ve been excited to read your update! Keep an eye on that gash!!! Ugh!! Be careful out there!! I know I could NEVER do what your doing!!!! You are a brave young sole! I pray you stay safe! Great post, you give the trail bloggers a lot of laughs and personality. 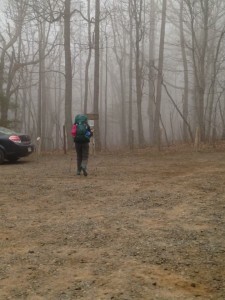 Keep going you motivate me (a future thru hiker wanna be) and i am sure everyone else that reads your updates. Keep them coming, i look forward to reading all the great adventures. Hang in there. This reminds me of the time I tripped on a curb 2 miles into the Chicago Marathon and ran the remaining 24.2 miles with blood streaming down my leg and concerned people offering medical assistance. You’re tough and will get through it. Enjoyed your post. It seems to me you have the right mind set. Nothing ever goes as planned especially with mother nature. NO DOUBT YOU HAVE THE COURAGE. Might want to look at ankle brace for the first part of the trail. Time to build up muscle safely if you haven’t got them already. Looking forward to your post . Best of wishes. Your posts are great! They typify everything you are and have become: funny, intelligent, and adventurous,(just to name a few). I hope all of the CC workouts in middle school helped prepared you for this journey. Best of luck and have a great time. Molly, don’t know you from Adam, but really proud of you! 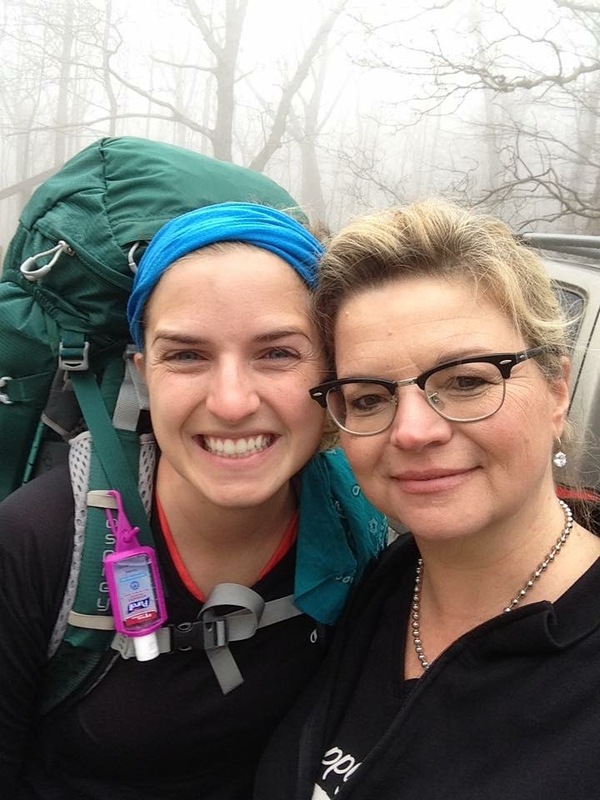 Stories like yours encourage and inspire those of us who have not embarked on our adventure yet to get off our butts and get on the trail! Keep trucking! And thank you!! 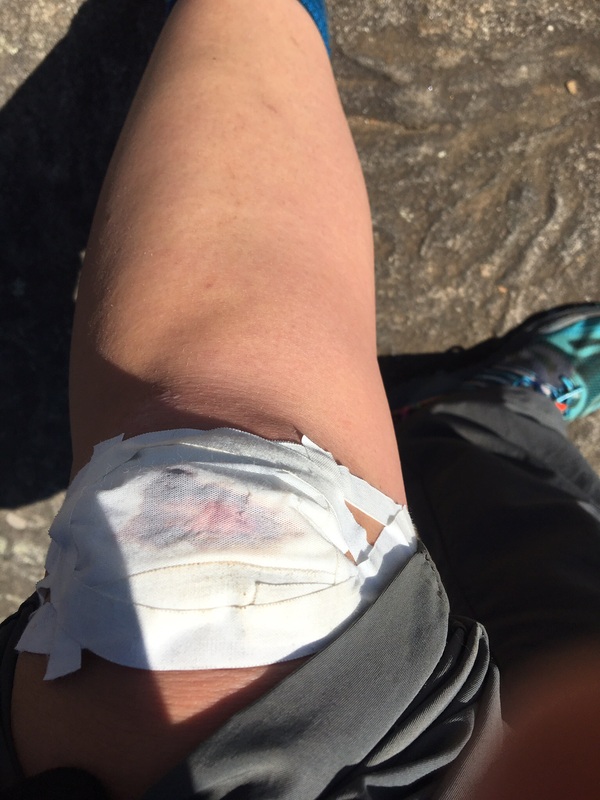 The knee abrasion did not look much infected, but cameras are designed to filter out red skin tones to hide pimples, thus making people appear in photos as not so pimply, perhaps more attractive. Your knee is infected. Help it heal by by means of applying rubbing alcohol. Oooo! It stings! So what! Your a long distance hiker now. You can deal with pain. Make that abrasion go away with rubbing alcohol. And stop falling down. You learned to walk a long time ago. You’re not a little kid. Use your trekking poles to stay upright. Don’t become impaired. You cannot afford to get sh*t faced falling down drunk.